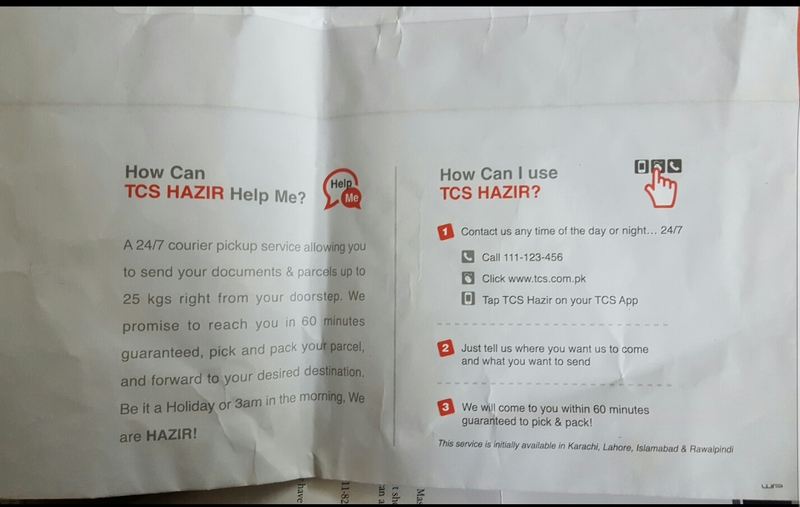 Jee Huzoor: The Awesomeness of TCS Hazir Service! Remember that review of the movie Actor in Law? Now how I got tickets for that movie is another story altogether and I owe it all to TCS Hazir. I had decided to go to Mega Multiplex, Millennium Mall for the movie because Nueplex is quite far from my mother’s home where my baby had to be dropped. But going to Millennium Mall only for the tickets seemed like such a chore to me as Millennium Mall neither falls on the way from my office to home nor on the way back. Thats is when I got to know about TCS Hazir through a Facebook group. TCS Hazir is a service by TCS which can serve as your personal pick and drop guy. Just call them up, tell them what you want and from where. They will pick it up and drop at your desired location. And all this just for 200 Rupees. This is a God send service for people with extremely busy lifestyles. Here is what I did. I called 111-123-456, requested for TCS Hazir and was immediately connected to the representative of TCS Hazir helpline. I relayed him my request that I wanted him to get me four tickets of Actor in Law of the 8:00 pm show on Saturday and get it delivered to the address I gave him. He took my number and said that he would call me back after confirming that the tickets were available. After some time (during which he probably called Mega Multiplex to confirm that the tickets were available) he called me back and confirmed my order. He also asked me at what position of the cinema would I prefer the seats? Front, Middle or at the back? After that I put down the phone and got these messages. I think this is a pretty awesome service and my lazy self plans to use this service as much as possible to make life easy peasy!